Don’t wait until the season. Start your game prep now! Football Play Card is the product I have been looking for for years. Anything that takes the tedium out of my time is of great value. While drawing and preparing scout cards is a necessary function of game preparation, I never felt it was the best use of my time as a coach. There were other things I could do to better serve my team. Football Play Card turns what was once hours of work into minutes. Right now is the optimal time to create your database of scout cards for the season. Pulling and printing scout cards, or even better, loading them to your iPad and saving printing costs, will be simple when the season hits if you put in a little work now. As the school year ends and you have more time to be a football coach, putting time into this project now will help you spend more time on watching film and coaching your players during the season. Read more about Football Play Card here. This is a solution well worth the time and money. Having the extra hours available in season will prove valuable as you are able to focus on the things that help you be more effective as a coach. 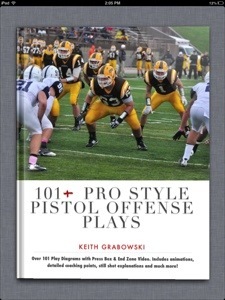 The play action chapter from 101+ Pro Style Pistol Offense plays is now available on the iPhone. This version will work on iPad and Mac as well, but please note, it is formatted differently. This means that while all of the content is there, features available for the iPad/Mac are not available on the iPhone. Slides that were packaged in interactive presentations or photo galleries are simply images that will appear singly on the iPhone. I’m excited that I’ve been able to get this onto another device. The rest of the chapters will be released soon. The play action chapter is my favorite because it shows how our unique footwork and approach to play action from the pistol is so effective. Enjoy and look for more soon. Get From 101+ Pro Style Pistol Offense Plays: Play Action for just $4.99 here. It includes sections on Naked, Naked Wheel, Full Run Action Drop Back, and Flash Faked Play Action. All the details needed to add this effective method of play action to your offense are included. Success on the goal line is critical. In general, coming away with a field goal when you have driven down inside the opponent’s 5-yard line is a win for the defense. The challenge in this is determining the personnel and play package that will be used. Because it’s an area that you might end up running only three to five plays a game in, there is a balancing act in practicing it properly as well. Operating as a pro style pistol offense that utilized many spread and one back elements, we found we were most comfortable converting our play concepts into an under center, multiple tight end application of our offense. The starting point Our starting point is operating from a winged, double tight, I formation. If for some reason we don’t have a tight end or fullback who could be used in this situation, we borrow a player from the defense or split one receiver. The examples you will see incorporate both a flanker and a wing. Fundamentally, how we block the play does not change. To be efficient in practicing this situation, our initial installation of plays is to one side only from one formation. We add the opposite side for the play incrementally throughout the season. Much of this philosophy involved running behind our best player…read more. 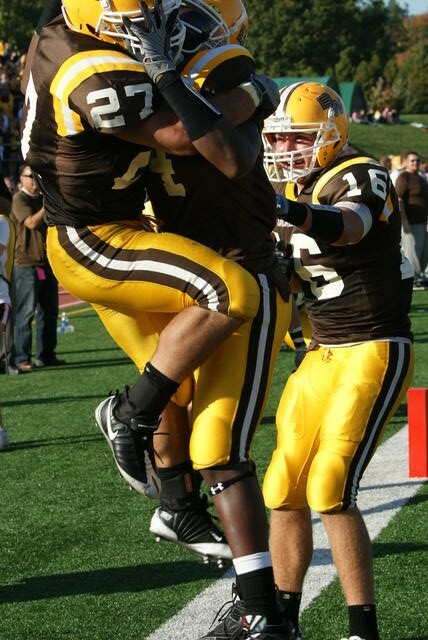 In 2004, we went through a process where we went back to the drawing board with our offense. We implemented the zone running game into our offense, which was an important step in rewriting the school’s record books, and producing the state’s leading rusher, but more importantly, we created a system that had the answers for everything we needed from week-to-week and year-to-year to attack our opponent’s defense. 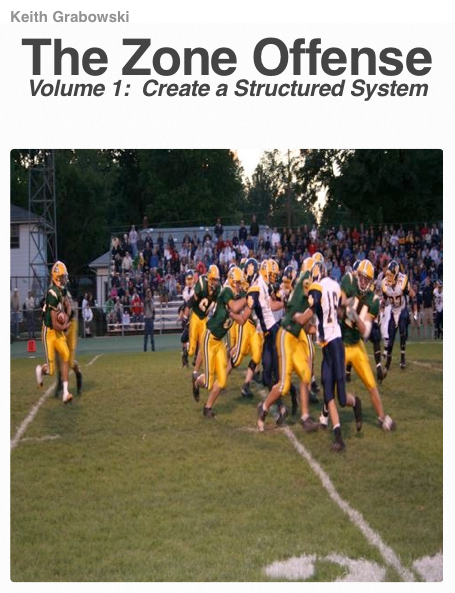 My new iBook The Zone Offense: Create a Structured System explains the process we used step-by-step and provides a game plan to rethink the structure and teaching of your own offense regardless of the system. The plan is detailed in a clear and concise manner. 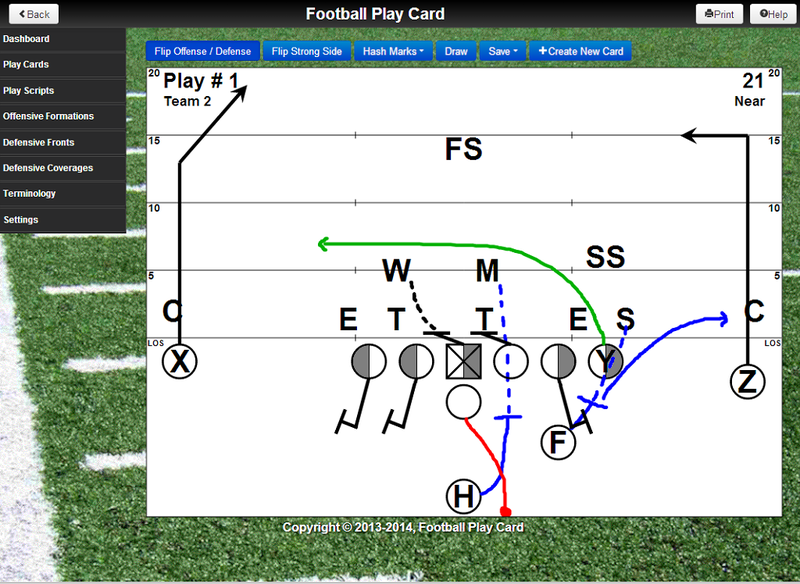 The zone running game serves as the basis and example in explaining and illustrating the process. Create a Structured System has you look at what you have set up already and helps you analyze and find places where you can create multiplicity with small changes. The goal is to create an attack that is efficient and effective in both implantation and adjustment. If the zone running game is your interest, then this is the ultimate resource for learning and installing it. Volume 1 gives the details of the stretch play and explains how we used that one concept to set up our entire offense (it averaged 10.3 ypc). You will not be disappointed in the detail and format used in this multitouch book. the technology and the platform work together to teach the concept in a very dynamic manner. The iBook is loaded with content and coaching points. Nearly 700 slides worth of interactive and hyperlinked presentations and a total of 51 minutes of video give the details. In many offensive systems, the receiver on the line of scrimmage, away from the formation strength is called the “X” receiver. For many teams, this is their best receiver. He is a player that can force double coverage or bracketing. His role is to win on his routes, especially when he draws single coverage. Many of today’s defenses match this player by putting their best cover corner on him. The advantage created by the X can be realized when a specific plan of action is in place to attack the defense who leaves him singled up. By making him a focus, the ball can end up in his hands for a big play, or he can create a situation where another player is able to get open because of the defense’s reaction or strategy to stop the X.